I had the opportunity to get into the shop for a few hours this afternoon. I finished laying out the dadoes for the shelving. It’s during this process I noticed a discrepancy in my layout. The bottom two draws are supposed to be 2″ deep, but the bottom draw will be 2 1/4″ deep. It doesn’t really matter and might make gaining access to the secret compartment easier. Still, too late now! 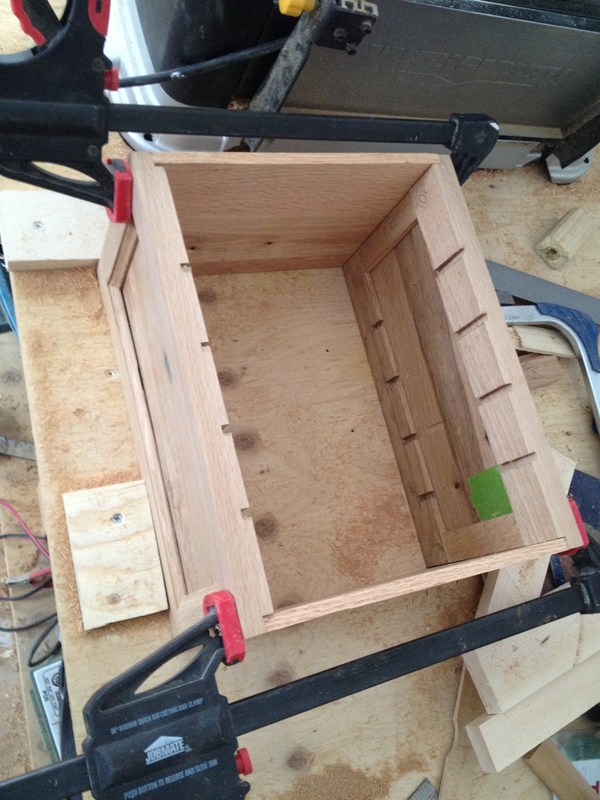 My plan calls for 1/4″ dadoes for the shelves to sit in. 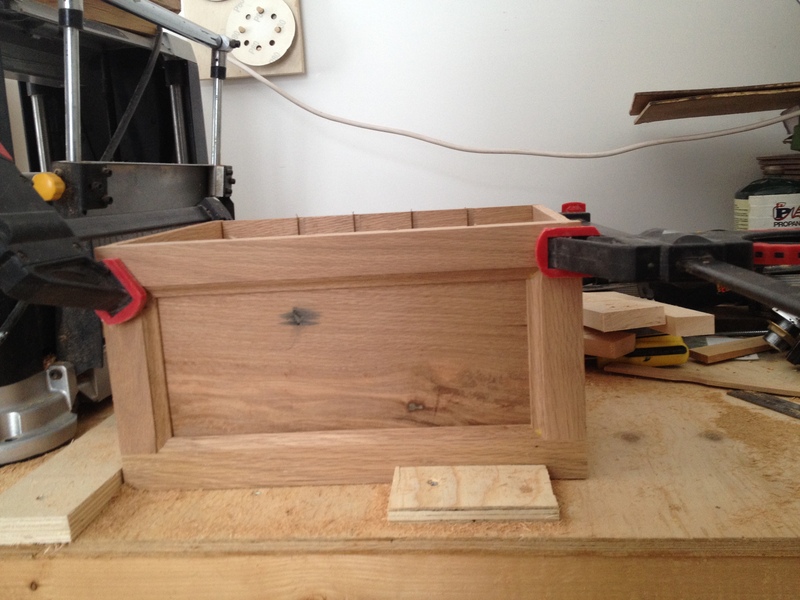 I mounted my 1/4″ router bit in my small hand held router, and set up the fence to make the dadoes. 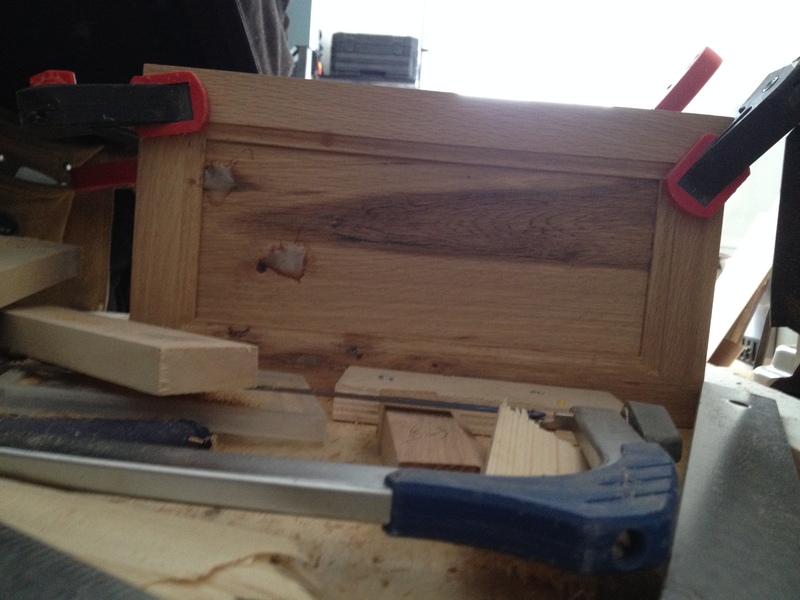 I slipped a little at once point and the router bit took a little chunk out of the panel. Thankfully it’s going to be on the inside so I don’t think I’ll need to do anything about it. With the dadoes cut, I thought I’d just double check the width of the dadoes with my calipers. Lucky I did. The very cheap router bit set I’ve got aren’t exactly milled to the most accurate degree. 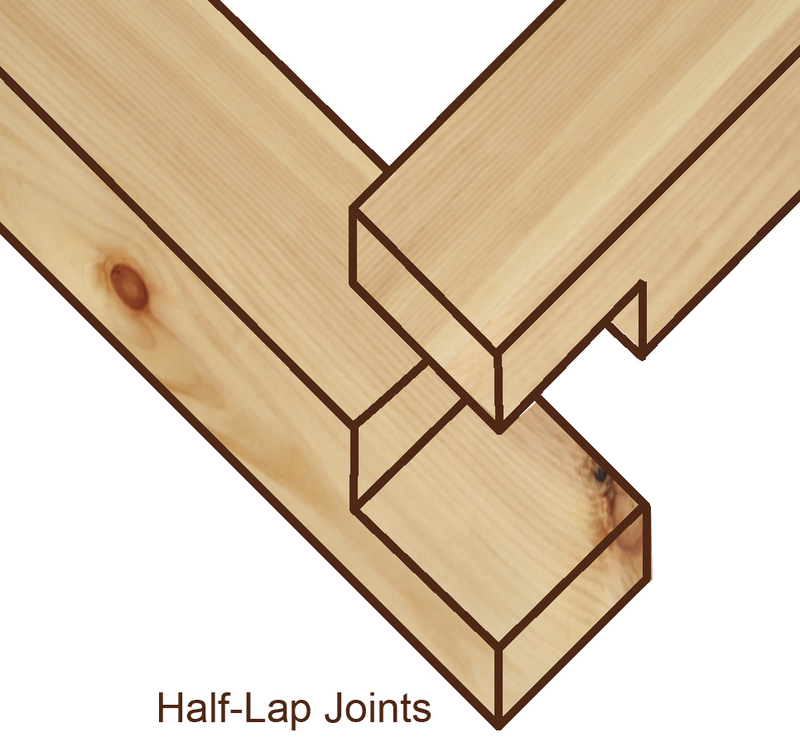 Turns out my .25″ is closer to .235″ so it’s lucky I don’t need to actually route a dado exactly 1/4″ wide. Once the dadoes were cut, I put the 3/8″ rabbet in the back of the box to accept the back piece when the time comes. 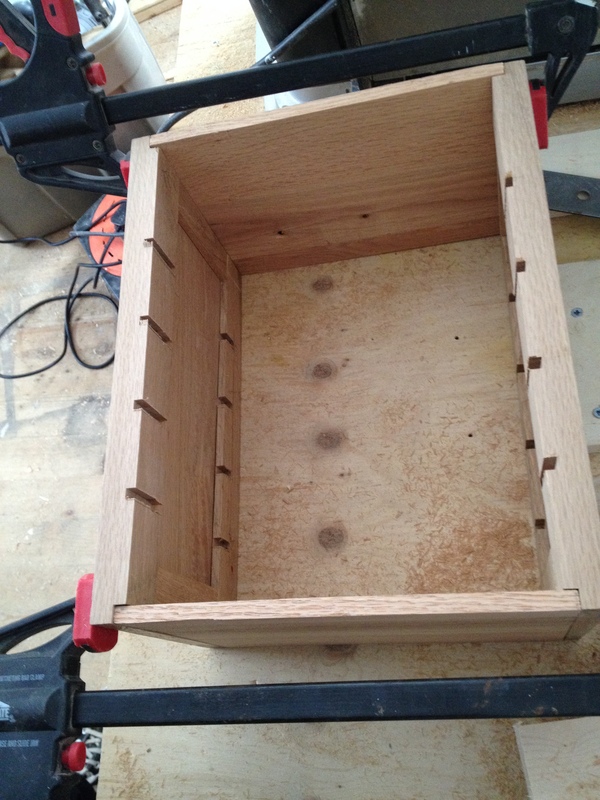 I’ve dry fit the case to double check the fit and to see how it’s all coming together. 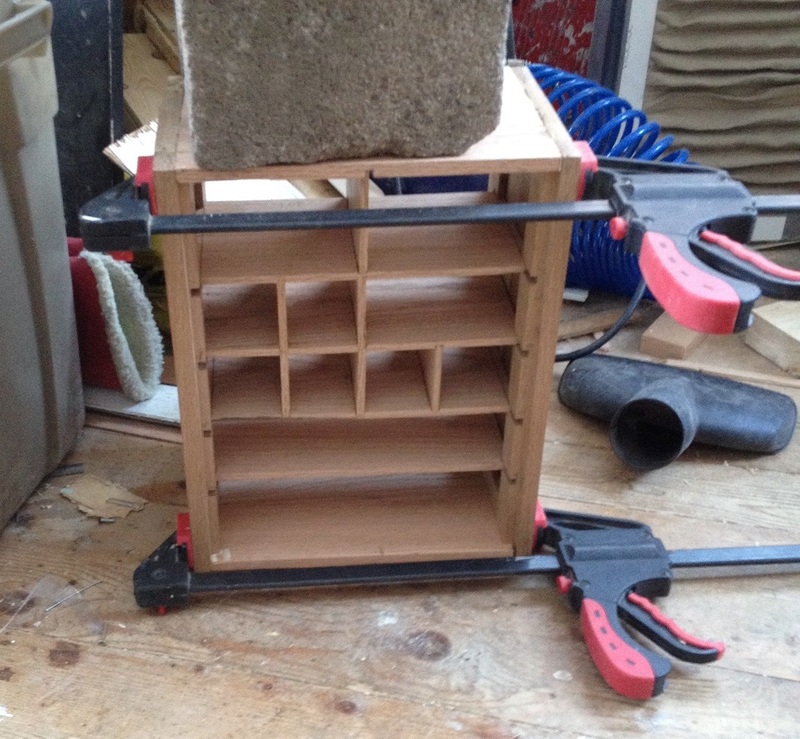 The wood panels I have aren’t quite wide enough to fill the dadoes all the way back, so once I’ve finished fitting the top and bottom I’ll need to shaved down the width of the shelves and shape some small pieces to fit in the back of the dadoes. 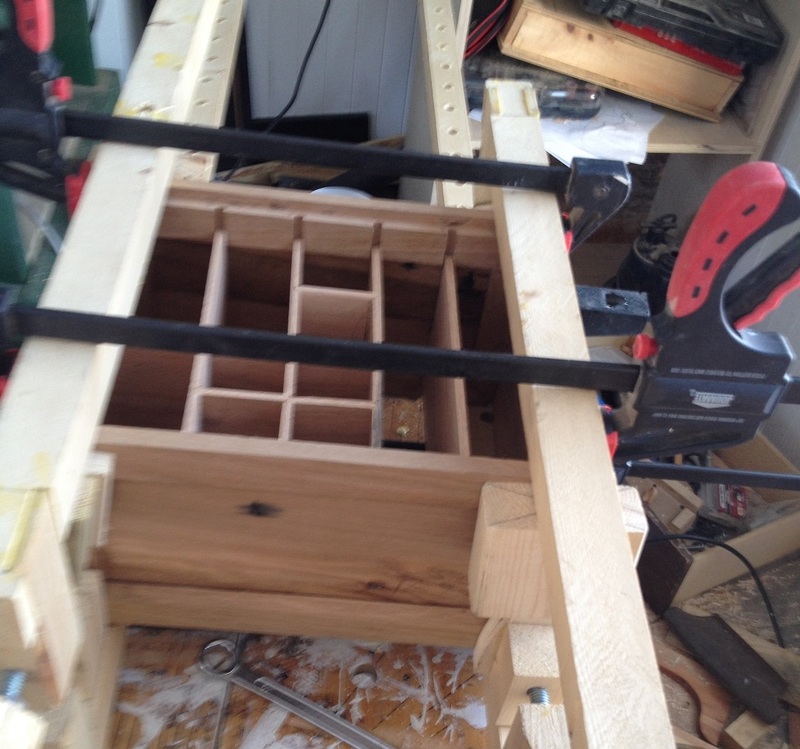 Not a terrible solution as they won’t be seen and won’t affect the performance of the draws that’ll be resting on them and the 1/4″ shelves will more than strong enough to hold the weight of the drawers and their contents, especially once the dividers are installed. Next I need to finish cleaning up the epoxy and scrape the insides of the panels to smooth them ready for finish. 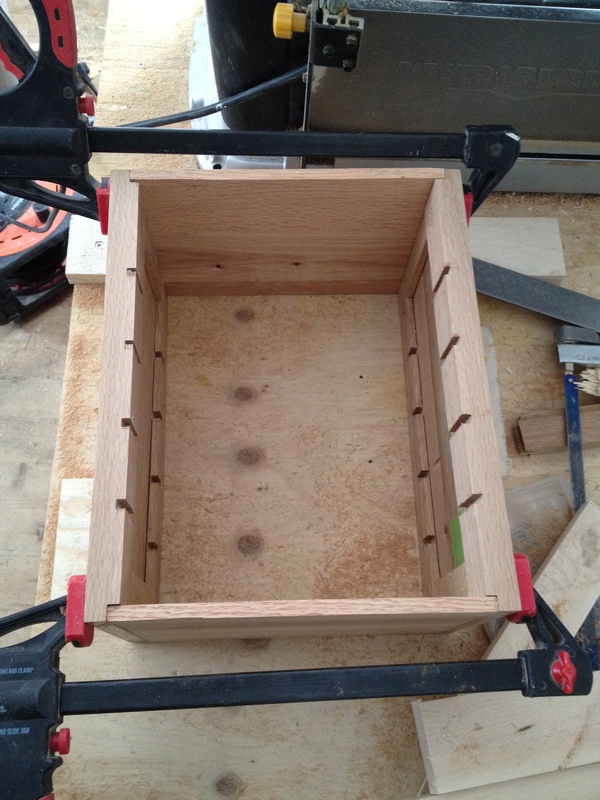 I also need to resaw some more 1/4″ stock for the remaining shelf and the dividers. 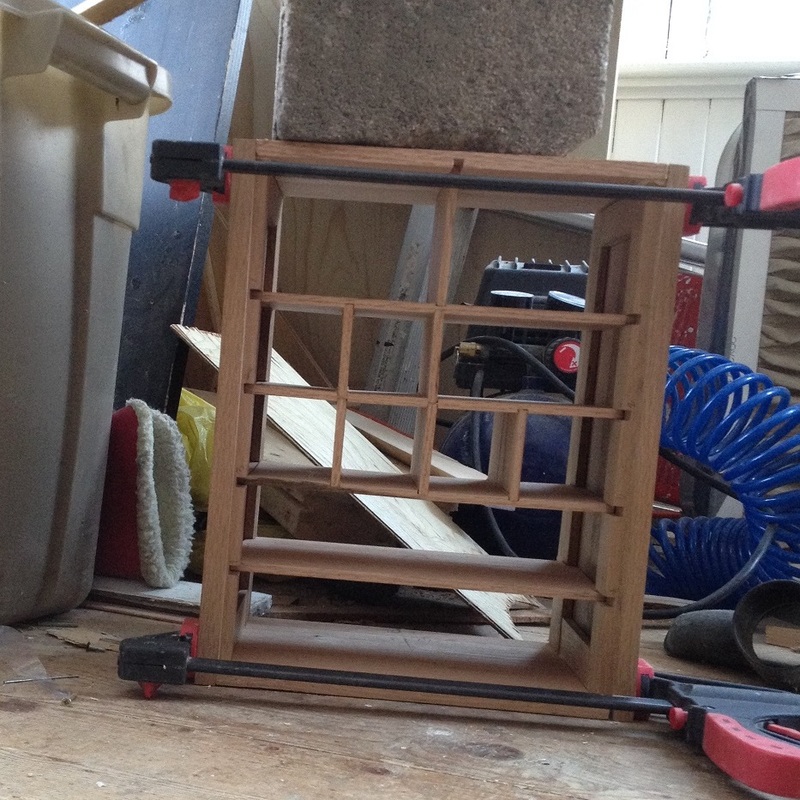 Then I need to cut the dadoes in the shelves for the dividers and route the round overs for the fronts of the shelves. Somehow the top and bottom aren’t quite square which is a little odd because the were cut in one pass on my mitre saw, so I need to square those edges up to make a nice tight fit. 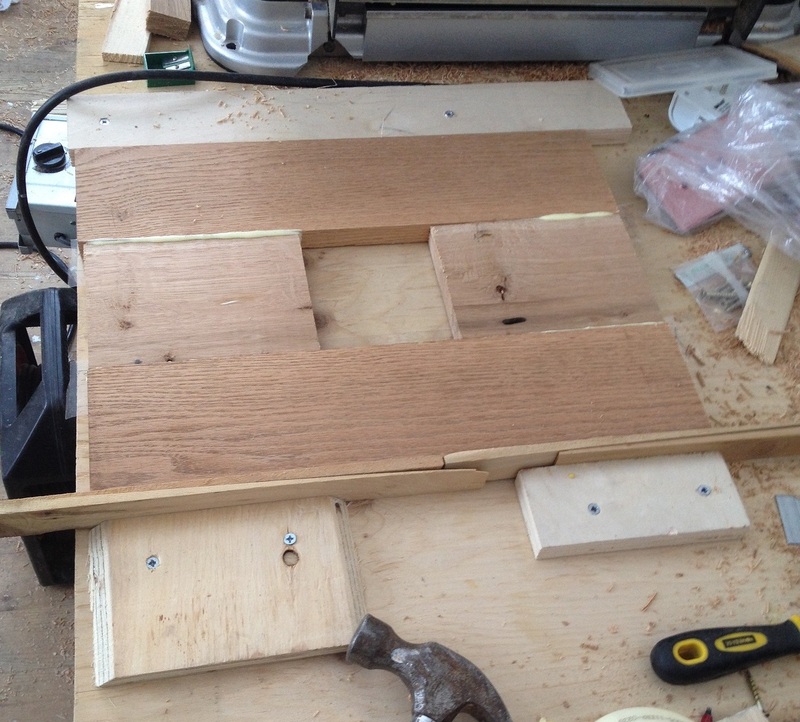 This might require building another tool – a shooting (or chuting depending on your heritage) board. I don’t think my hand plane sides are quite square and anyway it needs a lot more work before it’s going to be usable as a plane. It’s fine if the stock is thin, but much more than 1/2″ and it’s very hard to push though, let alone be used to smooth anything big and flat. 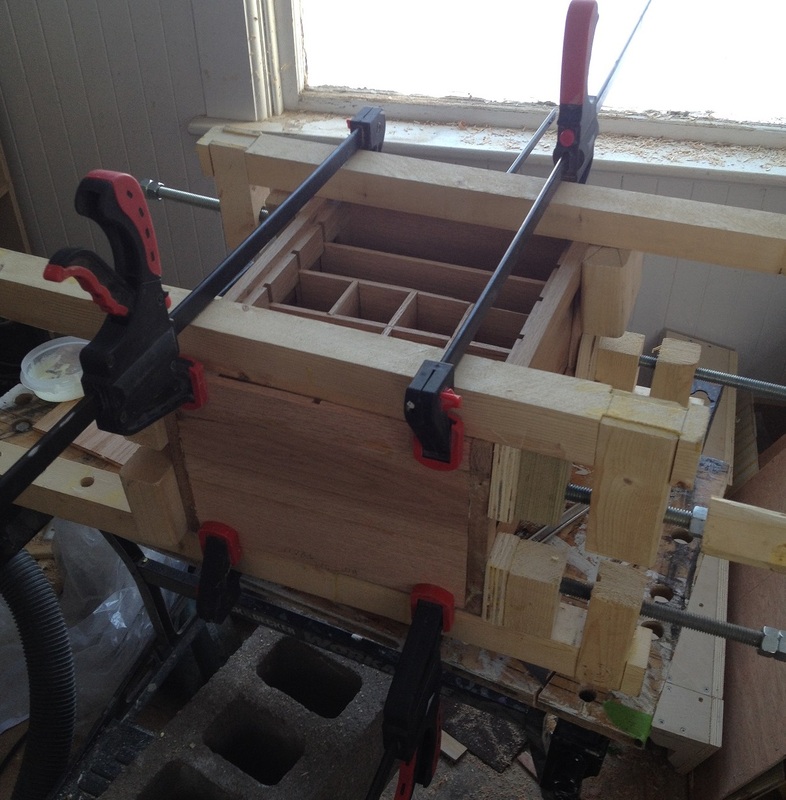 So I might end up building a sanding block system and see how that works out.